Ronin is a complete modular multi-effects rack. Feturing two delays, two multi-mode filters, two tube saturation stages, and two LFOs, with a fully routable signal path, Ronin is a total solution for analog-style effects. With "bucket-brigade" modeled delays, Ronin is capable of tape-style delays, true analog chorus effects, and flanging in to the stratosphere, for everything from basic subtle synced delays to complete audio destruction. We have just put version 1.6.2 installers in the store for both Windows and OS X. 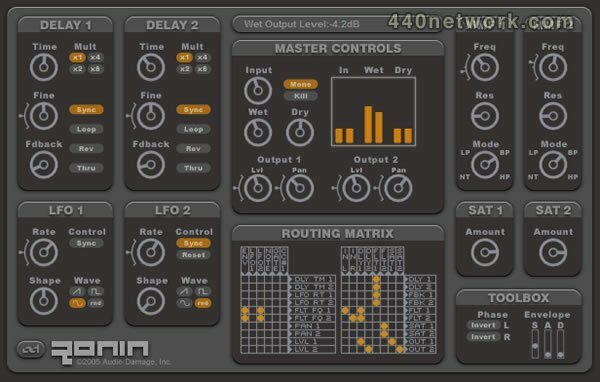 This update includes 32- and 64-bit versions of Ronin for AU and VST, and has many bug fixes. Note that some older projects that are loaded with the new Ronin may experience issues with LFO and delay times being slightly altered. This is due to a bug fix and is unavoidable. Please prepare your projects accordingly. 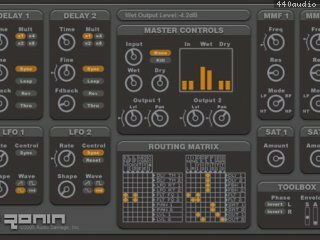 The Ronin AudioUnit has been updated to 1.5.2 to fix a problem with Logic vis-a-vis preset browsing, and to fix an issue with the routing matrices not updating correctly. The VST versions are unaffected.